Millennium 7 Publishing Co.: Responding To YOUR Happy Social Customers? 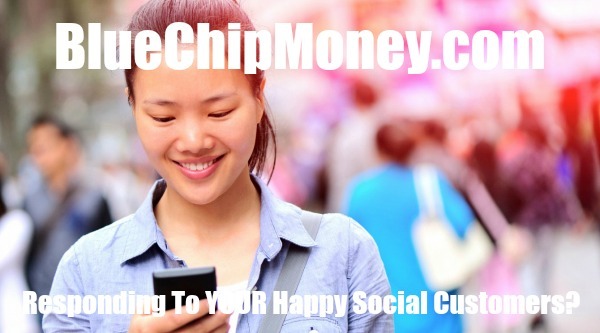 Responding To YOUR Happy Social Customers? 4 Simple ways to respond to a happy customer in social media..
One thing that emerged with the advent of social media as a viable customer service channel was that customers suddenly had a vehicle with which to deliver… compliments. Related Article: Growing YOUR Social Media Reputation? Despite all of the bad press about heightened complaints about brands in social media – much of it deserving – an overlooked benefit of the channel is the growing list of nice things that people have to say about their customer experience. People share their experiences on social media based on a simple equation involving expectations and emotions. If a brand exceeds expectations, customers are happy, and their willingness to share their experience in social media is actually very high. How (or even if) a brand responds greatly contributes back to the customer experience itself. The idea that somebody takes time out of their day to tweet at a brand or post on their Facebook page something positive about their experience is really incredible. Think about it: That never used to happen before social media became popular. A call center rarely if ever got phone calls where the agent answered the phone and the person on the line said, “I'm just calling to tell you that you did a great job!” It just didn’t happen. So why do many brands not bother to respond to compliments on social media? --The traditional role of “customer service” is to handle problems. A recent study by Sprout Social found that 88% of social marketers say customer service is important to their brands, but that isn’t translating to brand responsiveness to positive comments. This is most likely because responding to compliments has never been part of the customer service remit. --Social marketers have moved on. When social media arrived on the scene, marketers quickly learned that a unique aspect of this marketing channel was that customers could actually talk back. Social media gave customers a voice, and marketers were soon out of their league trying to answer complaints. Initially, they brought in customer service to handle the questions and the negative comments, leaving the fun, positive interactions for the “community manager.” But over time, all customer interactions have moved to the contact center. --Lack of resources. Many companies are not properly resourced to handle all social media interactions, and/or social media agents are pulled off that channel in times of high call volumes. This creates stress on responding to all questions and complaints, let alone compliments. --Compared to avoiding the public relations nightmare of a negative viral tweet, the perceived value of customer compliments is relatively low. Companies believe that fixing problems is more important than keeping happy customers happy. When someone compliments a company publicly, it gives companies valuable feedback about what they doing right. It is important to figure out how to do more of that so you can make more customers happy. In addition, positive comments provide that elusive word-of-mouth marketing that many brands are spending lots of money to achieve – even though it is right under their noses. --Say “thank you.” This seems obvious but is so often overlooked. After all, a person has just performed an unsolicited nice gesture – telling the world about the great experience he or she had – so the least companies can do is express some gratitude. Including some personalization, like the customer’s first name, agent’s first name, or a fun related GIF will make the experience more memorable. --Engage with the happy customer. Tell them that you appreciate them as well, ask them questions about their experience, and show some interest in them since they have shown interest in the company. Consumers today want a relationship with brands, but that relationship must go both ways. --Share or retweet positive comments. Not only is this giving the happy customer a public badge of honor, it is sharing objective feedback about the company with others. Many studies have confirmed that consumers trust friends, family and each other more than they do brands. --If resources are severely constrained, at least take the time to “Like” or “Favorite” positive comments. This small gesture is still appreciated by power users because they know the brand has at least seen the comment. Since it is so difficult and expensive to acquire new customers, keeping existing customers happy is paramount. In social media, happy customers self-identify, making the company’s job easier. So take positive feedback for what it is – a gift – and be sure to respond in kind. Excerpts from Winning at Social Customer Care: How Top Brands Create Engaging Experiences On Social Media, available on Amazon. Guest Authored Dan Gingess. Dan is a marketing and customer experience executive who has consistently focused on delighting customers. He is the author of “Winning at Social Customer Care: How Top Brands Create Engaging Experiences On Social Media” and the co-host of the Experience This! Podcast. Hear more from Dan in his book Winning at Social Customer Care and on his podcast Experience This! Follow Dan on Twitter.